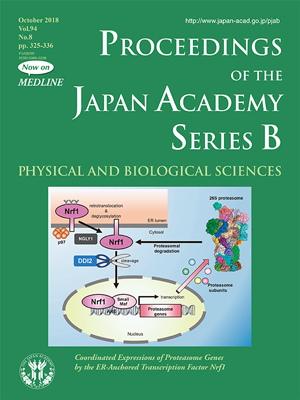 Dysregulation of proteasome function is associated with many human diseases. Decreases in proteasome activity are observed in autoinflammatory syndromes and neurodegenerative diseases, whereas increases in proteasome activity are observed in various cancer cells. Proteasome inhibitors are in clinical use for cancer treatment, but the emergence of drug resistance is a major concern, where an increase in proteasomal gene expression and proteasome production occurs upon pharmacological inhibition of proteasome function. This “bounce-back” response is mediated by the endoplasmic reticulum (ER)-anchored transcription factor, Nrf1 (nuclear factor erythroid-derived 2-related factor 1). In this issue (pp. 325-336), S. Murata reviews the roles of Nrf1 and its processing enzyme, DDI2, in proteasome biogenesis. The 26S proteasome is a huge protease complex comprised of 33 distinct subunits, each of which differs in structure and function. Because the proteasome catalyzes the degradation of over 5,000 cellular proteins, it plays an indispensable role in diverse arrays of biological processes such as DNA repair, cell cycle, immune responses, signal transduction, and protein quality control. Therefore, maintaining proper proteasome activity is essential for cellular homeostasis, and impairment of proteasome activity promotes the coordinated expression of all proteasome subunits genes. Nrf1 is normally continually degraded by the ER-associated degradation (ERAD) pathway; Nrf1 is ubiquitinated, extracted from the ER into the cytosol by the AAA+ ATPase p97, deglycosylated by NGLY1, and then degraded by the proteasome. Thus, Nrf1 is usually a short-lived protein maintained in low amounts. When proteasome activity is compromised, Nrf1 escapes degradation, and instead, is processed by aspartyl protease DDI2 (DNA-damage inducible 1 homolog 2), resulting in its translocation from the ER to the nucleus. Processed Nrf1 heterodimerizes with small Maf proteins and binds to the ARE sequences in the promoters of proteasome subunit genes to stimulate the expression of all 33 proteasome subunit genes. Murata and colleagues were the first to demonstrate that DDI2 is required to cleave and activate Nrf1 in mammalian cells (Elife 2016). The produced subunits assemble in an orderly fashion to generate functional proteasomes. On the front cover, Dr. Murata has illustrated a model of how DDI2 activates Nrf1 to compensate for proteasome dysfunction. Further studies of proteasomal regulation will be promising for the development of new strategies to improve healthy aging and treat various diseases.